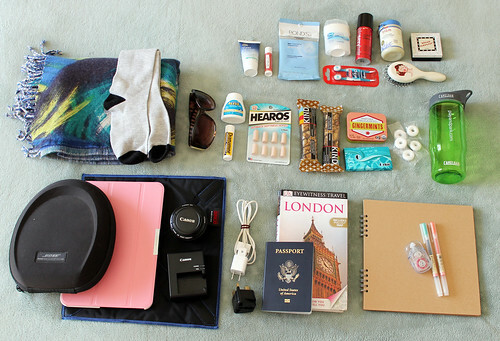 vitamini handmade: What's in my carry-on. I LOVE traveling. Flying...eh, not so much. But a well-packed carry-on bag makes a world of difference by making me feel a little more at ease as I'm boarding the plane. 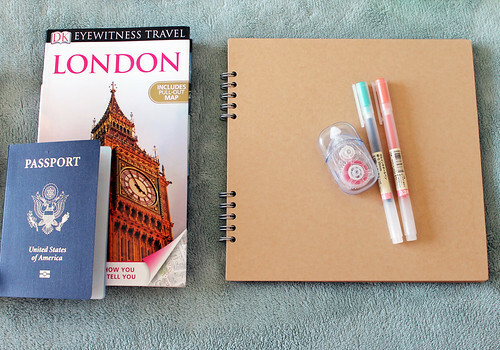 So when I prepared for my 10 hour flight to London (eek - 2 months ago! 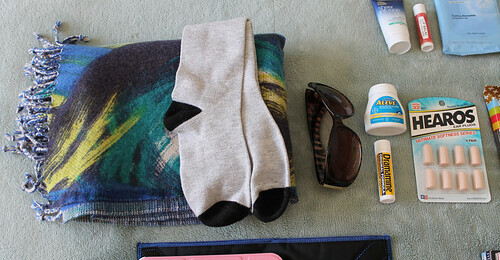 ), I made sure to pack all of the necessities and a few creature comforts that would help me chillax. 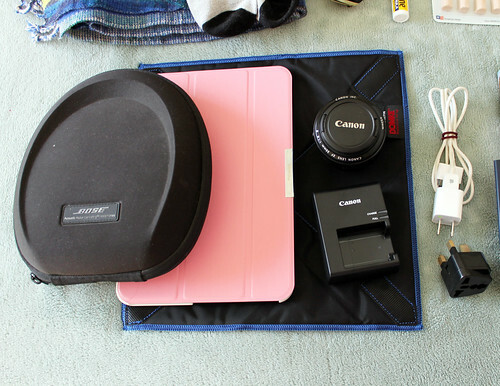 Here's what I packed, in 5 categories: Comfort, Toiletries, Snacks, Technology, and Activities. Comfort: Long flights can get cold, so I brought a large scarf to wrap myself up in. Since feet tend to feel fat on flights, I usually like to take my shoes off, and knee-high socks are great to have to keep your feet and legs warm. Nothing worse than cold ankles! Sunglasses are good for when the sun comes up when you don't want it to. Dramamine is unfortunately a must for me, so I always pack it when I'm flying. Pain killer for those jet lag headaches. Earplugs to block out engine noise and crying babies. Toiletries: If you're like me, a long flight can leave you feeling a little haggard. 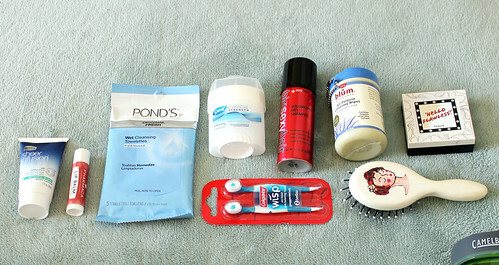 Here are my necessities to keep me feeling and looking alive and refreshed when the plane lands: moisturizer, lip balm, makeup removing face wipes, deodorant, dry shampoo, hand wipes, mini toothbrushes, hairbrush, and pressed powder foundation. 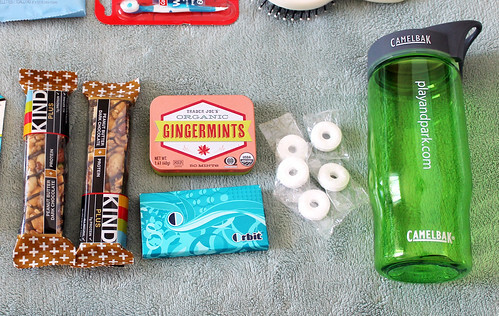 Snacks: I hate depending on those random meal times on the plane, so I pack a few things to help tide me over if I feel like I'm starving. Kind Bars. Have you tried these? So good. I always pack a variety of mints and gum. And an empty water bottle to fill up when you get past security. Tech: Nothing like having some tech stuff to keep you distracted. I brought my Kindle Fire HD - Great for watching movies. I borrowed my Mom's Bose Noise Cancelling Headphones, and I think they saved my life. The airplane engines were practically silent inside these bad boys. Great for listening to movies and music, too. I also brought my camera (not pictured, cause it was taking these photos!) camera batery charger, iphone charger, and a UK Power Adapter. It would be a huge pain if my cell was out of charge and I couldn't plug in when I arrived in London. I also had my cell phone with me. I wrapped my camera and lenses in Domke Wraps. No need for bulky camera bags with these. They worked well and kept my equipment safe and easy to access during my entire trip. Activities: A guidebook to the place where you're going! Distract yourself with a little hint of the sights you'll see when you get there. My favorites are the DK Eyewitness Guides. If you're feeling ambitious, bring a little scrapbook and some pens to do a some journaling if you're tired of reading or watching movies. Definitely not in the activity section, but don't forget your passport and other travel documents!! All of this fit nicely in my standard-sized backpack. I also carried a purse with my wallet, phone, etc. Those are my necessities. 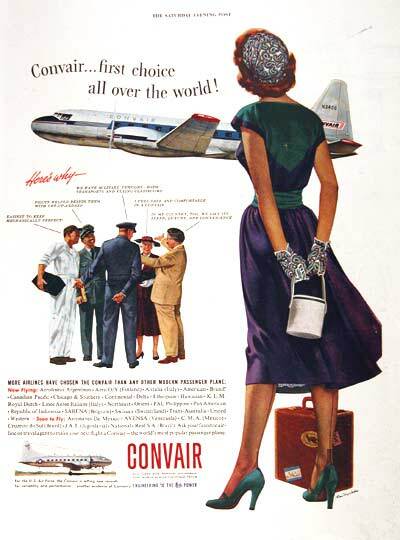 Do you have anything you can't fly without?